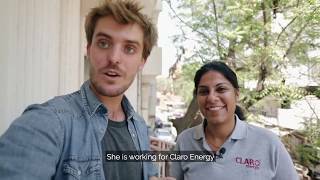 Claro Energy offers solar-powered water pumping solutions to meet irrigation and drinking water needs in off-grid rural areas in India. The company offers the entire spectrum of solar pumping solutions, ranging from 0.5 Horse Power (HP) to 10HP, AC & DC solar pumps, Surface and Submersible pumps, across applications such as Irrigation, Drinking water, Aeration & Fisheries. With an installation base spread across 14 states, Claro Energy has impacted over 1,00,000 people in India. For more information please see the IDTechEx report on off grid zero-emission electricity. In India, a developing country whose economy is centred around agriculture, and which is rapidly transitioning into the realm of renewable energy, the future of solar pumps seems brighter than ever. This is testified by the increased impetus given by the Government of India to the widespread deployment of solar pumps- in the Budget 2018, there has been a budget allocation of Rs 48,000 crore for distributing 17.5 lakh solar pumps, and solarizing existing pumps, as part of the 'Kisan Urja Suraksha evam Utthaan Mahabhiyan (Kusum)' scheme. The scheme has additional objectives of setting up 10,000 MW solar plants on barren lands, besides allowing farmers to sell the surplus produced energy to state electricity. This move is a welcome step towards ensuring the financial stability of farmers, and at the same time, bolsters the government's ambitions of integrating a vast share of renewable energy in the overall energy mix. India is blessed with an abundance of solar energy and has a massive potential to transform this into electricity- the National Institute of Solar Energy in India has determined this amount to be a whopping 750 GW. Equally massive is the presence of agriculture in the Indian economy- it employs nearly 50% of the workforce, and contributes 17.32% to India's GDP. Thus, an intensive economic practice like this needs reliable practices that can ensure a high yield of agricultural crops, such as efficient irrigation techniques. Water pumps have emerged as a dependable mode of irrigation, and the advent of renewable energy has ensured the rapid advancement of solar water pumps. At the fore of this breakthrough is The Ministry of New and Renewable Energy (MNRE), which has collaborated with various state governments and started promoting solar water pumps by providing various subsidies to farmers. The majority of pumps used today are either grid-connected or run on diesel. However, remote, off-grid areas, the rising prices of diesel, as well as the environmental implications of its usage, raise several questions over the efficacy of these traditionally-powered pumps. India's economic well-being hinges on that of the rural economy, which in turn depends on cost-effective agriculture. Solar pumps can be heralded as a solution that the rural agrarian society needs- they can be used in power deficient and remote regions, and reduce diesel consumption, both necessary steps to ensure sustainability as well as a clean environment. Besides, they provide farmers with an opportunity to generate extra income by selling surplus energy. The Prime Minister of India, Narendra Modi, has set an ambitious target of producing 175 GW of electricity from renewable energy sources by 2022, during the recently held International Solar Alliance (ISA) Summit at Rashtrapati Bhavan, New Delhi. The recent news of Diu becoming the first 100% solar powered Union Territory further cements the government's conviction towards this great cause. This enormous increase in installed solar capacity would entail a proportionate increase in jobs related to solar energy. Indeed, achieving these renewable energy goals would be a step closer towards realizing an energy-secure and sustainable future. Claro has also pioneered a mobile irrigation service, retrofitting e-rickshaws with solar panels that can get to remote villages and provide irrigation on a pay-per-use basis. Using 'pay-as-you-go' RFID cards, cash or micro-finance, the mobile solar trolley is offering affordable, on-demand irrigation without requiring capital investment. In turn, farmers save up to 50% of irrigation costs by displacing diesel, according to the company's head of Institutional Business, Sonal Adlakha. India has seen over $42 billion in renewable energy investment over the last 4 years. Claro Energy is a part of the upsurge of innovation that's helping India to meet its 100 GW solar power target by 2022—an important part of the country's overall global climate change commitments. Claro Energy's solar water pumps are a great solution in remote, off-grid regions. Plus, farmers can earn extra income by selling surplus energy. Another Claro innovation: e-rickshaws that bring pay-per-use solar panels to farmers, who can then irrigate using RFID cards, cash or micro-finance. Claro Energy is at the center of a new initiative that combines mobile and stationary solar-powered mini-grids and links them to irrigation. This "irrigation-as-a-service" business model is already being used by dozens of farmers in India's Bihar state. Claro Energy's pay-per-use irrigation service is an affordable, convenient source of on-demand irrigation that will enable farmers to irrigate more land, increase production during the summer, and to invest their resources in more efficient technologies, all while decreasing greenhouse gas emission.